Eddie Flynn was an ex-con-man-turned lawyer. These days, he’s an ex-lawyer-turned-alcoholic who hasn’t set foot in a courtroom in a year, following the breakdown of a high-profile case. Now, in the bathroom of the diner where he eats breakfast every day, a Russian mobster has put a gun to his back and abducted him. The gangster has a proposal for Eddie, the type of proposal that a person doesn’t turn down: Eddie will defend Olek Volchek, the head of the Russian mafia, in an impossible murder trial with a bomb strapped to his back. For added incentive, Olek is holding Eddie’s daughter hostage, and Eddie has forty-eight hours to defend his client, or work out a way to get his daughter back. Luckily for Eddie, his chequered past has left him with a lot of contacts, and more than a few owed favours. 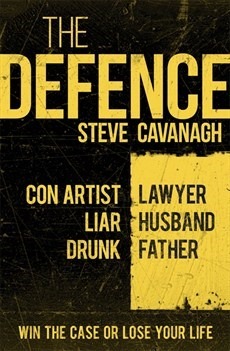 Belfast native Steve Cavanagh describes his debut novel, The Defence, as a “legal-thriller”. This reader can reveal that the emphasis is most definitely on the thriller, though the plot does allow for a fair amount of courtroom drama. We are introduced to Eddie Flynn, one-time con-man, one-time practicing lawyer, at the moment that the Russian mafia decides that he can help them achieve their nefarious ends in the trial of their leader, Olek Volchek. This tense and riveting opening gives us little time to get to know Eddie before he is thrown into the thick of the plot, so much of what we know about him by the end of the novel we learn in bite-sized chunks between the almost-relentless action. It quickly becomes clear that Eddie Flynn is more than your average muscle-bound action hero.There is wit and a sly intelligence here, and a pride in his own ability that makes it clear he was once a force to be reckoned with in the courtroom. His dark past, the life of a petty criminal, and his close relationship with the leadership of the city’s Italian mafia, add to the mystery, and provide him with an almost endless source of resources to tap, and contacts on whom he can call in his hour of need. The daughter – held hostage by Volchek’s minions against Eddie’s continued cooperation – adds some further meat to the bones of this already well-fleshed character: Eddie’s life may be falling apart at the seams, but he still loves his daughter, still feels some element of responsibility for who he once was, and what he has done. The tension increases as the story progresses, and Cavanagh injects a number of perfectly-realised set-pieces (the night-time trip around the upper ledges of New York’s Chambers Street Court building is one that springs immediately to mind) designed to keep the reader perched firmly on the edge of their seat, and completely immersed in Eddie Flynn’s rapidly-disintegrating world. Despite Eddie’s sense of humour, which lifts the tone of many of the novel’s darker scenes, there is something ominous about the events and, while the first-person narrative contains a clue concerning Eddie’s survival beyond the end of The Defence, nothing else comes with a cast-iron guarantee, and the very real threat that hangs over Eddie’s daughter is one that remains with the reader throughout. It’s a masterful play, a clever piece of plotting that overshadows even the bomb strapped to Eddie’s back. That said, Eddie isn’t in for an easy ride, and the author takes some delight in putting his character through the mill during the course of the story. Despite all this, there is still the “legal” part to the “legal-thriller” combo that the author uses to describe the novel, and Cavanagh uses every trick up his sleeve to ensure that the courtroom scenes are as attention-grabbing and engrossing as those that take place outside those formal and refined environs. Eddie’s sharp mind and quick wit leave the reader wishing for a glimpse of the man at the height of his legal career, and hoping for a more permanent return to the courtroom as the series (for series it is) continues. It’s a rare talent that can make the staid and solemn courtroom environment as entertaining and engrossing as the against-the-clock all-out action that makes up much of the rest of the novel. The Defence heralds the arrival of a fresh new voice in Irish crime fiction, a voice that is as authentically American as the character at the centre of this excellent debut novel. A gripping read from first page to last, it is a new breed of thriller that nevertheless pays its dues to those who have come before: Jack Reacher, John McClane and, maybe, Perry Mason. Cavanagh’s is a name you should expect to hear a lot of in the coming years, and Eddie Flynn is destined to become as instantly recognisable as his forebears. In a word: unmissable. I have this to read and review – time to get round to it, methinks. Great review.